I am a firm believer in appreciating and enjoying even the smallest positive things in life for many reasons, not the least of which is that they are always present if we look for them. Life has ups and it has downs and enjoying the small things is a big help in the challenging times. And fun in the up times! I found enjoyment and encouragement in two small Spring signs in the past two days when I least expected them. 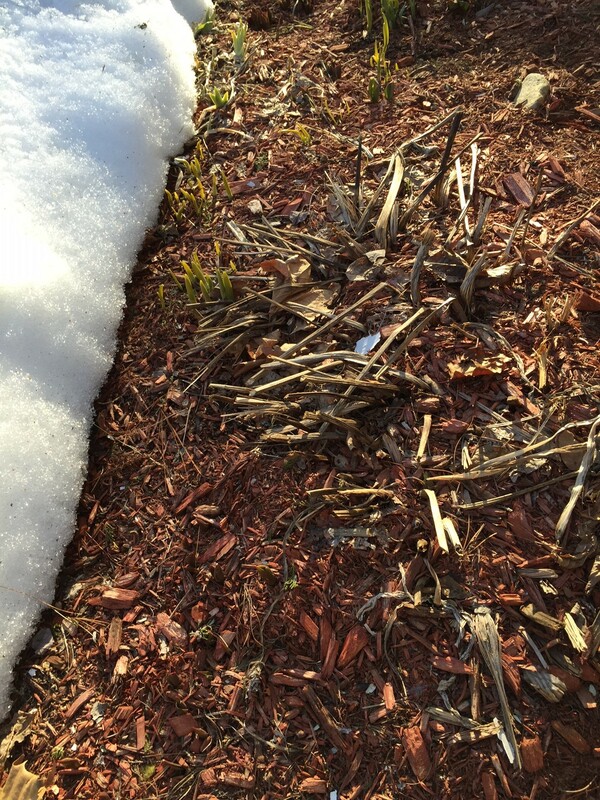 On Monday I noticed that some ground against the back of our house was bare and that spring bulbs are taking advantage and coming up! 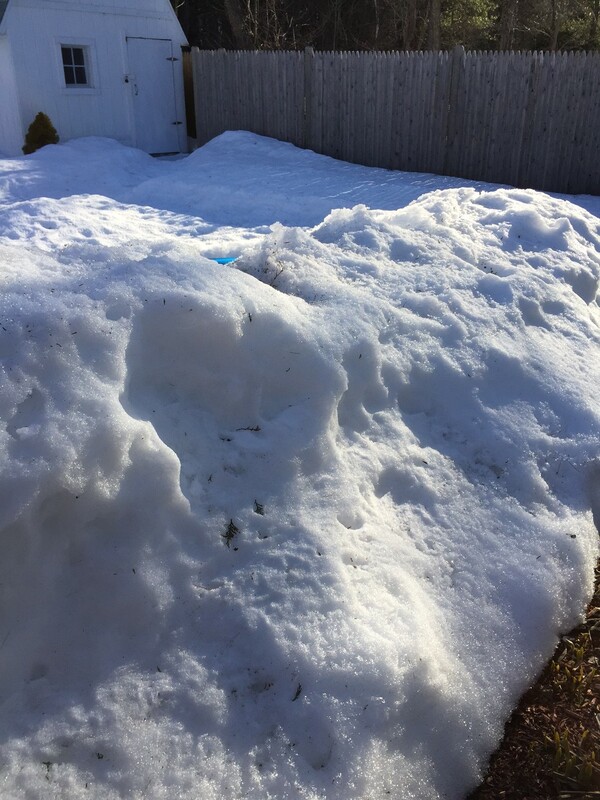 Here they are and if they are difficult to see since they are short now, my next picture of the snow pile next to them will explain why I didn’t get closer to take the picture. I guess I could lie on top of the snow pile to get one but I am not that avid a photographer! I have made the first one large so the bulbs can be spotted. The next two won’t be because they might scare you if too large. The snow isn’t as deep everywhere as this because it has been piled here. It is all working on melting now. The ability of living things to survive in weather extremes in nature has always fascinated me. I remember seeing 3 deer a few years ago and thinking they looked young- then realized they were probably just thin because it was near the end of winter. On the deer front, in October I was in the yard when a buck walked into it. I stood watching him from maybe 150′ away and he watched me. When he started to paw the ground like a bull I decided it might be time to quietly go inside! The other day my husband heard the chickens making a ruckus and looked out to see what was wrong. He saw a deer in the yard. Apparently they were angry at the intrusion. The deer didn’t seem to care. The chickens keep on going despite the cold too. Of course we have tried to create the best winter environment for them by only leaving a few spots for ventilation so they won’t be in a draft, and have taken several other measures. My criteria when choosing the breed was cold hardiness and being docile. They live up to it. They keep on cranking out 3 brown eggs a day without us adding heat or extra light to fool them as some do. They are very social with humans but not deer apparently. This is an old picture and they are bigger now. 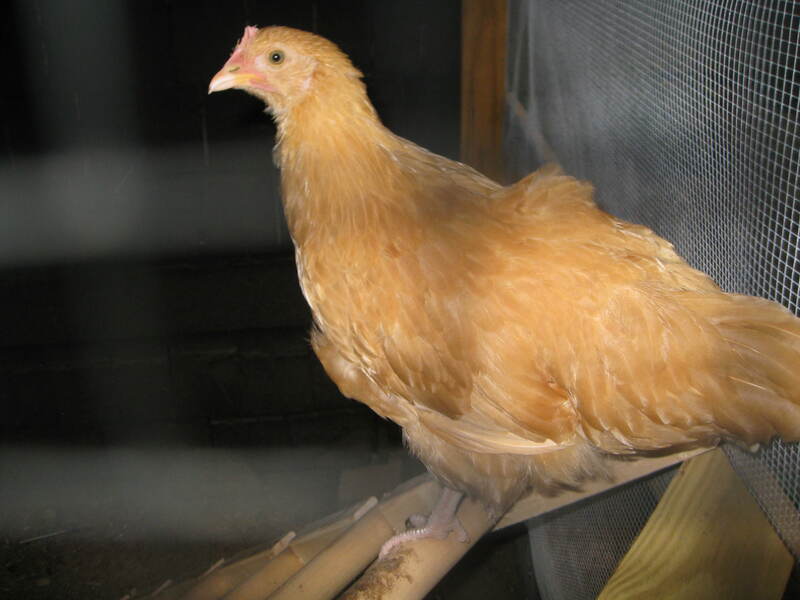 Buff Orpington hens can get to 7 pounds but I don’t know how much they weigh. They are very social with humans and one always scurries to the top of this ladder when anyone approaches the run and they make happy noises. They know treats are likely involved! Just as animal behavior interests me I also find human behavior interesting. When we have visitors I enjoy seeing their reactions to the chickens. Some give a cursory glance and continue the discussion in progress, some watch them with interest, and others- the majority because I would be drawn to friendships with animal lovers- talk right back to them, sometimes in chicken language, and then ask to go in the hen house and feed and hold them, all of which is easily accommodated. Today I am off to spin at the yarn shop, Auntie Zaza’s Fiber Works, where I teach spinning and fiber preparation, and now soap making in a joint workshop she and I have where I teach soap making and she has them make facecloths. Later I am looking forward to a talk at the Sharon Historical Society about life in the 1600’s. Of course if the speaker doesn’t bring up spinning I will. He must be doing that. I am reminded of the fact that many of the words and expressions in our language today come from our history with sheep and wool. I think I will start mentioning one in every blog post. Spinster is a fun one. At least it is for people like me for whom spinning is a fun hobby, not a survival skill. Spinsters were unmarried woman usually beyond what was then considered marriageable age, who lived with family and spun a lot of wool for the family and to bring income. Of course we link it with the other out of date term, an “old maid,” which sounds negative but it gets me to thinking- food and shelter would be provided for me if I just… spun all day?? Hmmmm. Okay, my other sign of spring happened yesterday when I was leaving work. I heard a redwing blackbird in a nearby marsh. Very exciting for me every year but especially this one. They traditionally come back from wherever they go in the month of March and I hope that shows that they think spring is on its way. I think I saw an Osprey last week on the Cape and they too come back now but I can’t say for sure if that is what I saw. I am also looking forward to having my spinning group here on Saturday. I am pondering what to serve for lunch but know it will be something that uses eggs. A lot of eggs. This entry was posted in Uncategorized and tagged Auntie Zaza's Fiber Works, Buff Orpington chickens, chickens, deer, eggs, encouragement, handspinning, redwing blackbirds, sings of spring, snow, spinning, spinning history, spinsters, Spring, spring bulbs on March 25, 2015 by Betsy Alspach.